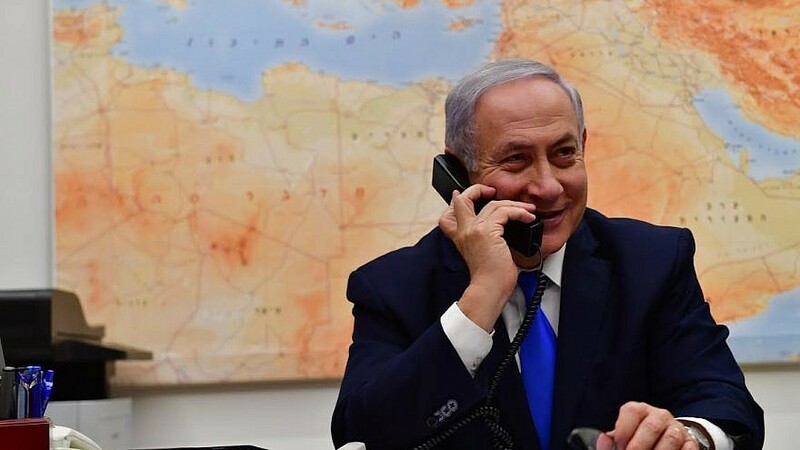 Israeli Prime Minister Benjamin Netanyahu speaks to U.S. President Donald Trump over the phone on March 21, 2019, thanking him for the United States recognizing Israel's sovereignty over the Golan Heights. Credit: Kobi Gideon/GPO. (April 1, 2019 / JNS) A network of hundreds of mostly fake social-media accounts has meant to boost Israeli Prime Minister Benjamin Netanyahu and tarnish his opponents ahead of next week’s April 9 national elections, according to an Israeli watchdog report released on Monday. The Twitter and Facebook messages have been shared by the prime minister’s son, Yair Netanyahu, and Likud campaign officials, according to the report by the Big Bots Project, a research group backed by the left-wing Tides Foundation, which is supported by American-Hungarian billionaire George Soros’ Open Societies Foundation. The New York Times and Yediot Achronot received advanced copies of the report. The report adds that the network may violate Israeli laws related to elections, privacy, taxation and campaign finance. Netanyahu and his party have denied the report. “All of the Likud’s digital activity is entirely authentic, and is based on the great support of the citizens of Israel for Prime Minister Netanyahu and the great achievements of the Likud,” said party spokesman Jonathan Urich. “A million Likud voters are not bots,” he added.